Tim Simpson was a 2 sport athlete at East Peoria with a combined career wrestling record of 157-4, including 3rd and 4th place IHSA state finishes. His first love was football, where he was a 4-year starter, 2-time All-conference and an All-Stater. Choosing Illinois, the 6'2", 282 lb. offensive guard lettered 4 years, starting an Illini-record 48 games, including four post-season bowl games. 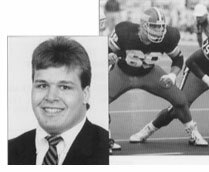 Simpson was named to the 1st team American Football Coaches All-America squad in 1991 and was co-winner of the Illini Male Athlete of the Year award in 1992. Selected by Cleveland in the 12th round (329th pick overall), Tim appeared in 4 NFL games with the 1994 Steelers. He later played with the Peoria Pirates, who won 2 league titles with Simpson on the roster.